Several writers with Nashville ties are nominated for election to the prestigious Songwriters Hall of Fame in New York City. 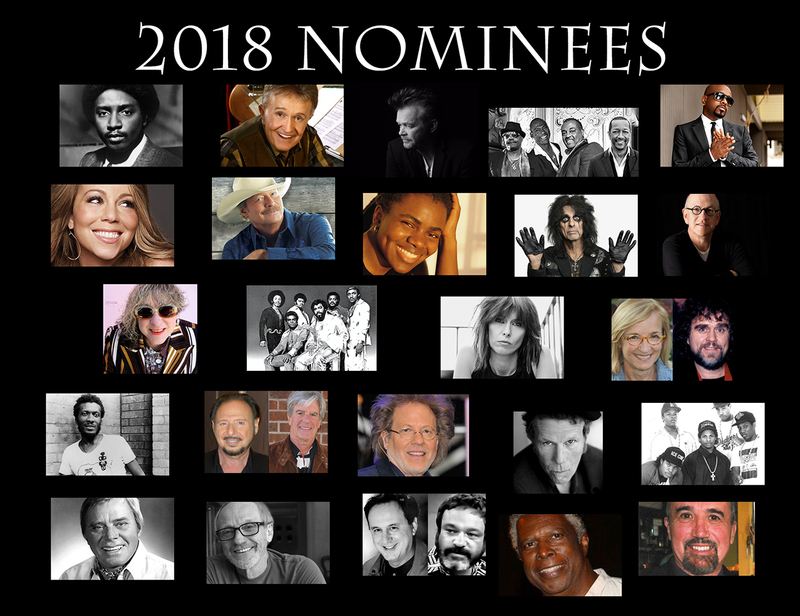 The organization announced its slate of nominees, which includes Tom T. Hall and Alan Jackson in the Performing Songwriters category, and Bill Anderson, Steve Dorff, Kye Fleming/Dennis Morgan, and Randy Goodrum in the Non-Performing Songwriters category. The Annual Induction & Awards Gala will take place June 14, 2018 in New York. Eligible voting members will have until Dec. 17, 2017 to turn in ballots with their choices of three nominees from a non-performing and three from a performing category. For information on joining or renewing as a voting member before Nov. 17 in order to participate in this election, please go to songhall.org/join. Tom T. Hall—Known as “The Storyteller,” Country Music and Nashville Songwriters Hall of Famer Tom T. Hall typically told stories in songs such as the Grammy-winning “Harper Valley PTA,” which allowed Jeannie C. Riley to top both the pop and country singles charts in 1968, and Hall’s own No. 1 country hit “(Old Dogs, Children and) Watermelon Wine,” which Rolling Stone has ranked in its list of 100 greatest country songs. Hall’s other hits include country classics “I Love,” “Country Is,” “The Year Clayton Delaney Died,” “I Like Beer” and “Faster Horses (the Cowboy and the Poet).” Other artists who have recorded Hall compositions include Johnny Cash, George Jones, Loretta Lynn, Bobby Bare, Waylon Jennings and Alan Jackson, who took his “Little Bitty” to No. 1 on the country charts in 1996. Alan Jackson—Country Music Hall of Famer Alan Jackson, who is also a member of the Nashville Songwriters Hall of Fame, has had 35 No. 1 country hits since his 1989 debut, having written or co-written 26 of them. They include such landmark singles as “Don’t Rock the Jukebox” (1991) and “Chattahoochee” (1993)—both earning Billboard song-of-the-year citations—and “Where Were You (When the World Stopped Turning),” Jackson’s 2001 response to 9-11 that won multiple awards at the Academy of Country Music and Country Music Association Awards, including Song of the Year, and also earned him his first Grammy Award for Best Country Song. Besides writing hits for other country artists including Randy Travis, Faith Hill, Clay Walker and Chely Wright, Jackson has covered songs honoring his favorite singers including Charley Pride, Hank Williams Jr., Merle Haggard and George Jones, while winning over 50 ASCAP awards for his own writing. John Mellencamp: * Jack And Diane * Hurts So Good * Pink Houses * Small Town * R.O.C.K. In The U.S.A.
Bill Anderson—The only songwriter in history to have written charted songs in each of seven consecutive decades, legendary Grand Ole Opry headliner Bill Anderson is among the few country songwriters to cross over to the pop charts in the 1960s with such hits as “Still,” “8 X 10,” “The Tip of My Fingers” and “Mama Sang a Song.” His first #1 (of 14) was “City Lights” for Ray Price in 1958 – when Anderson was just 19, and he soon had hits with the likes of Connie Smith, Hank Locklin, Porter Wagoner, Jim Reeves, Faron Young, Roger Miller and Kitty Wells. Topping the country charts in the ‘60s and ‘70s with classic songs like “I Get the Fever,” “My Life” and “Sometimes,” the hits he had from the ‘90s on with artists including Steve Wariner, Kenny Chesney, Vince Gill, George Strait and Brad Paisley (whose Anderson-penned “Whiskey Lullaby” won the 2005 Country Music Association Song of the Year award) led to his becoming the first country songwriter to receive the BMI Icon Award, in 2002. Steve Dorff—Grammy and Emmy nominated Steve Dorff has written songs sung by the likes of Barbra Streisand, Kenny Rogers, Celine Dion, Whitney Houston, Anne Murray, George Strait and Vanessa Williams, while also establishing himself as a gifted film and television composer. He’s tallied over 40 BMI awards with hits like Rogers’ “Through the Years,” Murray’s “I Just Fall in Love Again” (Billboard’s top country hit of 1979), Strait’s “I Cross My Heart,” Lee Greenwood’s “Don’t Underestimate My Love for You,” and Eddie Rabbitt’s “Every Which Way But Loose”—the title track from Clint Eastwood’s 1978 film. The father of actor Stephen Dorff and late songwriter Andrew Dorff, he also composed TV music for Spenser: For Hire, Murphy Brown, The Singing Bee, Just the 10 of Us, Growing Pains, Murder She Wrote, Columbo and Reba; his other film contributions include songs and scores for Bronco Billy, Rocky IV, Pure Country, Tin Cup and Honky Tonk Man. Kye Fleming/Dennis Morgan—Both signed to Charley Pride’s Pi-Gem Music publishing company headed by Nashville producer/publisher Tom Collins, Kye Fleming and Dennis Morgan began writing together in 1978 and quickly churned out “Sleeping Single in a Double Bed,” which became Barbara Mandrell’s first country chart-topper that year. That the team had the magic touch was soon borne out by such country hits as Mandrell’s “Years” and “I Was Country When Country Wasn’t Cool,” Ronnie Milsap’s “Smoky Mountain Rain” and “I Wouldn’t Have Missed It for the World,” and Sylvia’s “Nobody” and “Tumbleweed.” Morgan was inducted into the Nashville Songwriters Hall of Fame in 2004, and Fleming joined him there in 2009. Randy Goodrum—Nashville Songwriters Hall of Famer Randy Goodrum was the 1981 ASCAP Country Songwriter of the Year. But he had already made a big name for himself with hits like Anne Murray’s much-covered 1978 pop chart-topping signature song “You Needed Me.” Numerous other pop and country hits were forthcoming, most notably Steve Perry’s “Oh Sherrie” and DeBarge’s “Who’s Holding Donna Now” on the pop side, and Dottie West’s “Lesson In Leavin’” and the Kenny Rogers-Dottie West duet “What Are We Doin’ In Love” on the country side.